Big, bulky armchairs may still be around, and they may even be in fashion but if you have a small apartment or den you know that they won’t fit. These big chairs can completely overwhelm small spaces, turning your relaxing retreat into a claustrophobic nightmare. Instead of resigning yourself to a high backed chair, or bean bag, we found some reclining armchairs that were made for small spaces. Relax, read, or watch TV in complete comfort and still have room to walk around. These recliners are comfortable, stylish, and sturdy, and are also designed to look great in small areas or even in corners. Make your own relaxing retreat with one of these great recliners for small spaces. This chair is classified as a wall hugger recliner which means that it was designed specifically for small spaces. The chair only needs 4” of space to fully recline so you can almost put it flush with the wall. The sturdy chair is upholstered in a stain resistant polyester microfiber fabric, which is also breathable to help repel odors. 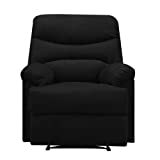 The chair reclines back to fully support your legs and the extra padding in the armrests lets you sink into comfort. Stylish and classic looking, this faux leather recliner fits great in any small den or library. The upholstery wipes clean easily, and fully leans back for full back and leg support. Polyurethane padding in the chair and foot rest gives you additional comfort, which is perfect for taking a quick afternoon nap. The recliner also features a convenient side pocket perfect for holding remote controls and magazines. 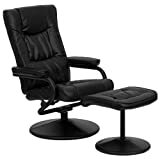 This reclining executive style office chair and ottoman are upholstered in environmentally friendly leather. The extra cushioning in the chair will keep you comfortably seated for hours. A sturdy and stable swivel base lets you easily switch to different tasks while you are working, and the leather wrapped ottoman gives you legs a break after a long day standing on your feet. The recliner and matching footrest can also be adjusted for height by the small knob on the sides of their bases. This matching recliner/rocker and ottoman may look big, but they can easily fit into any small area with their measurements of 30 ¾” L x 29” W x 43 ½” H. The chair and ottoman are both covered with soft leather upholstery, which is also stain resistant and easy to wipe clean. 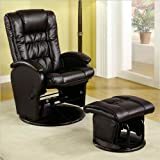 The recliner is also a faux glider, where you can still comfortably rock without having to worry about your chair moving. 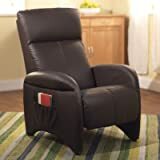 Extra padding in the seat cushion, arm and head rests make it easy to simply lie back and relax in this comfortable reclining/rocker. We hope that our picks for best recliners for small spaces will help you find the perfect chair to relax in without feeling cramped or claustrophobic.